So, I have to admit something. I really (and I mean really…) wanted to call these cookies “Blizzaster Cookies” – there was just something snazzy about it. However, I worried that name wouldn’t really be universally appealing, so I went with “Snow Cookies” instead. For those of you that might not know, the Midwest recently (i.e. 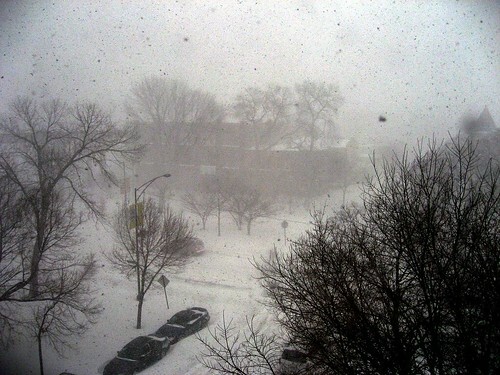 this week) experienced a somewhat severe blizzard. 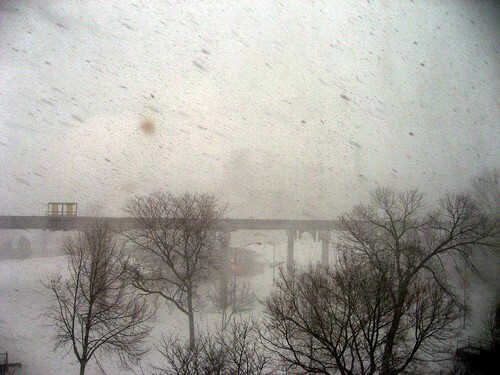 Some of the media labeled it a “Blizzaster” (yep…), and other called it the “Snowpocalypse” (hmm…). Whatever you call it, we can all agree that it was a crazy bad storm. We’d been hearing warnings for several days, but I never really place much weight in pre-storm hysteria. However, we we all got released from work at 2pm yesterday (and it started to snow), I started to wonder if we really were going to have a bizzard… how exciting (and possibly scary… but mostly just exciting)! Kirk picked me up at 2:30, and by then it was snowing pretty hard. And get this: a drive that should normally take 20 minutes (tops) took 2 hours. Traffic was insane. Every major street downtown (and heading in all directions) was blocked with people trying to get home before the storm got really bad. Kirk and I rolled home at 4:30pm, and hunkered down for the night. He made spaghetti with a tomato/spicy sausage sauce. It was tasty. As it got dark, the wind started to pick up. It was whistling and our windows were rattling and shaking like crazy. We also noticed that it was so windy that the curtains were blowing a little. Our windows are sealed incredibly well (not). We got out the painter’s tape and taped up the drafty joints. It was a really good time (meaning it was not that fun). Looking out the windows, it felt like we really were in the middle of a snowpocalypse. At this point in time I still wasn’t sure if I was going to go into work the following day (today). I mean really, we live in Chicago. It snows quite often during the winter – and people still go into work and the kids still go off to school. I should have figured that since the schools had already declared that they would be closed, I likely wouldn’t need to go to work. The thunder-snow should have been an indicator as well (thunder and lightening during a snow storm). Kirk and I went to bed and when morning rolled around, I knew I wouldn’t be going into work. We woke up to news of closed highways, stranded motorists, non-operating train lines, buried cars, etc… We spent a few hours watching the news and catching up on the most recent coverage of the Chicago Blizzard of 2011 (can I just say – – – I felt so bad for the motorists that got stranded on Lake Shore Drive for the night. I can’t imagine being stuck in my car sitting next to Lake Michigan in the middle of a blizzard). I started the day off by catching up on some work, and then spent the afternoon doing some baking. What else would you do if you were stuck inside? Hence the birth of the Snow Cookies. Position oven racks in the upper and lower thirds of the oven and preheat it to 350 degrees. Line two baking sheets with silicone baking mats (or parchment paper). Whisk together the flour, shredded coconut, baking soda, cream of tartar and salt in a medium bowl. Set aside. Whisk together the oil, egg, whipping cream, vanilla and almond extracts in a small bowl. Set aside. In the bowl of an electric stand mixer fitted with the paddle attachment (or using a hand-mixer – I just love my stand mixer so much! ), beat together the butter and sugars until fluffy and pale in color, about 2 minutes. Beat the egg mixture into the butter and sugar mixture on medium speed until well-blended. Scrape down the sides of the bowl. Reduce the mixer speed to low. Gradually stir in the flour mixture until all the dry ingredients are incorporated. The dough will be very soft. Using a 1-tablespoon-sized scoop, portion the dough into balls into the prepared baking sheets, 12 to a sheet. 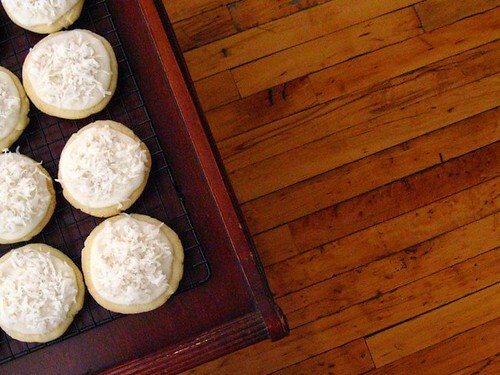 Make sure each cookie is flattened slightly, by pressing each cookie into a 2-3 inch circle. Bake the cookies until they are lightly golden and crisp at the edges, about 12-14 minutes, rotating the sheets from front to back and top to bottom about halfway through baking. Let the cookies cool in the sheets for a couple of minutes before transferring them to a wire rack to cool completely. When the cookies have cooled, whisk together the confectioners’ sugar, heavy cream, vanilla, imitation butter, and salt in a small bowl. Add the heavy cream in tablespoon batches – you may need more or less to get the right “spreadable” consistency depending on how dry the air is…. Put your shredded coconut into an easily accessible bowl. 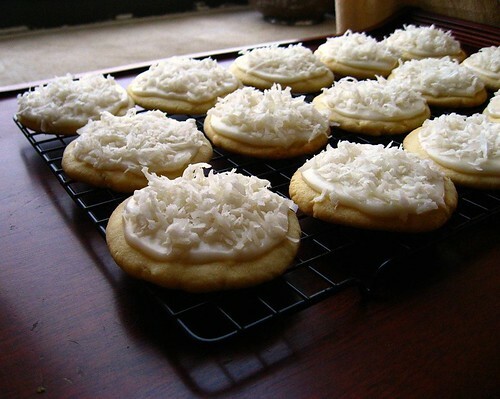 Spread each cookie evenly with icing (about 1 tsp) and sprinkle generously with the coconut. Let the icing dry for several hours before serving. Store in an airtight container for no more than 1 week (though really, I can’t see them lasting that long). White cookies and snow. Thanks. I love your cookies! I live in Chicago, too. Our street still hasn’t been plowed — hopefully they’ll get to it this weekend. I swear with all this snow, we’ll still have some on the ground come June! Hi Em, cookies look delicious! 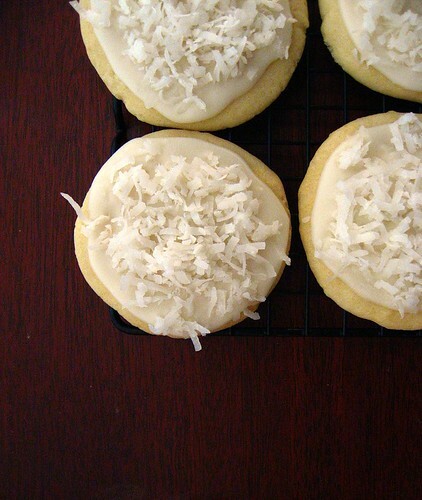 Is that freshly grated coconut you use on those cookies? Here in NYC, we’ve been getting horrible weather for the past month and a half. But these snow cookies definitely would put a smile on anyone’s face. Wonderful and yummy recipe. I have to try it. Thanks for sharing..
Oh my goodness! Those cookies look divine! Love the photographs! These looks delicious! 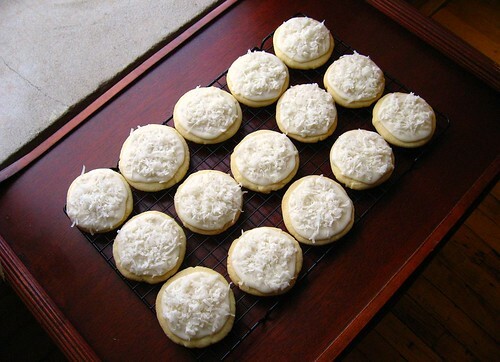 I am a big fan of the “blizzaster” name idea, but snow cookies sounds nice too! I will have to try these! Thanks for sharing! And awesome blog by the way! Hi! You’re the best cook in the house! You had me at coconut!! What a wonderful winter celebration. I live in Ottawa where we get tons of snow also. 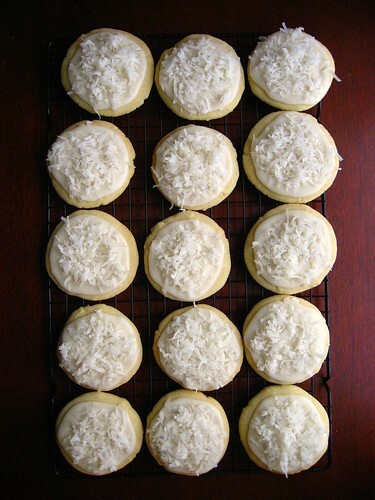 I hate winter and these coconut cookies made me smile. Great post. My aunt lives in Ottawa, and I was born in Ontario! So yes, I empathize with the snow issues 🙂 I’m glad the cookies made you smile! these sound so yummy. I’m grateful to be far away from any blizzasters, but I can pretend for the sake of making these cookies!